Microsoft has taken wraps of its latest device– the new improved Nokia 105 with a bunch of whole new features. Microsoft is planning to empower the people around the world to have a voice by bringing an affordable mobile phone which will hit the markets with a price tag of $20 ( Around 1200INR ). Quite cheap huh? The successor of the award-winning phone will now hold the capacity to 2,000 contacts and therefore helping you to connect to more people. The device promises to provide the users with enhanced voice-clarity and a talk-time of 15 hours so you can talk all the day. The Nokia 105 boasts to have a battery backup for upto 35 days of standby time which is more than a month, so apparently one can survive a full month with one single charge. 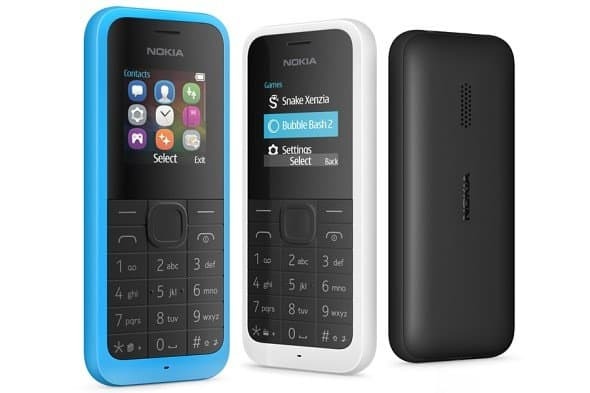 The new Nokia 105 is a dual-Sim phone so as per to avoid the burden of carrying two phones and features a 1.45-inch LCD Transmissive HighColor display bundled with a BL-5CB 800mAh replaceable battery. On the connectivity front, it supports a 3.5mm AV Connector for FM Radio, microUSB charger and supports MiniSIM. The phone operates on the Series30+ operating system and will be available in Cyan, Black and White color variants. The device will come pre-loaded with Snake Xenzia and Bubble Bash 2 for your entertainment and also provides torchlight for your convenience. The new improved round-look of the device will make it more visually appealing which includes a 108.5×45.5×14.1mm dimensional size and is said to provide with same durability as ever. For $20 the device looks a real good buy.